LAS VEGAS, NV — At a formal commemoration at CES 2018, the Advanced Television Systems Committee (ATSC), industry standards consortium for digital television, announced the release of ATSC 3.0 standards suite. 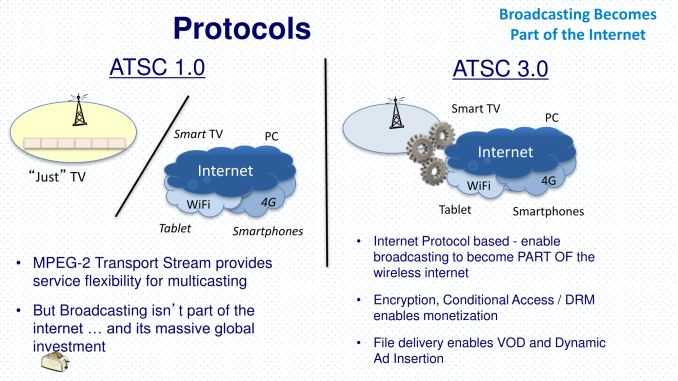 Like the existing ATSC 1.0, the standard governs digital television broadcast methods and protocols, but ATSC 3.0 takes a step further by incorporating broadband transmission as an IP-backchannel – in other words, ATSC 3.0 TVs and receiver devices can potentially have the capability to send and receive all types of content via the internet and over-the-air. Alongside it are a number of higher-end TV codec and standard enhancements: HEVC encoding for up to 4K at 120fps, wide color gamut, and support for Dolby AC-4 and MPEG-H 3D immersive audio systems. This advancement comes at a time when streaming devices and services are in its ascendancy, eroding the popularity of cable and satellite TV. Meanwhile, broadcast television, receiving signals over-the-air by antenna without any fees, has continued to be on the back foot, even after the transition from analog to digital with ATSC 1.0. With ATSC 3.0, the approach is to use the existing wireless internet infrastructure and multi-device streaming culture to its advantage, utilizing internet-style advanced cross-platform data collection to entice both consumers and advertisers. At the same time, ATSC 3.0 is looking to keep up with the audiovisual quality of competing solutions. HVEC is significantly more efficient than MPEG2, which is used by ATSC 1.0, and basically obligatory for 4K, high frame rates, and HDR. And going hand-in-hand is finally embracing the OFDM modulation method, which is generally better in non-line-of-sight scenarios, over ATSC 1.0’s 8VSB. Where 8VSB has a 19.3Mb/s bit rate, ATSC 3.0’s OFDM-based method, with more efficient LDPC forward error checking codes, has several modes from the most-robust 1Mb/s to the highest-capacity 57Mb/s. But putting aside capacity, the different modes allow simultaneous support of fixed and mobile devices. Beyond the eye candy of glossy display technologies, this flexibility, combined with ubiquity of WiFi, cuts much closer to the what and how of ATSC 3.0’s intentions. All-in-all, ATSC is touting a number of benefits for ATSC 3.0, but the standards suite covers a broad range of consumer-relevant capabilities and functionalities. In using an IP-backbone and latching onto broadband and multi-device use, ATSC 3.0 incorporates the titanic power of internet-facilitated data collection, pulls in the connected multi-devices to gather even more data, and stays streaming-friendly. For consumers, the ATSC points to greater interactivity and personalization, both fruits of data collection, as well as the expansion of television broadcasts and supplementary multiscreen content to smartphones, tablets, and other devices. For the most part, those additional devices like tablets and smartphones fall under the category of “companion devices” that communicate with an ATSC 3.0 primary device (e.g. television set or set-top/converter box) in order to present related, second-screen, or identical content as that on the primary device. The ATSC documentation lists a few usage scenarios, such as the companion device acting as a mobile duplicated screen, launching suggested mobile applications, displaying different video angles of the main screen, or functioning as a remote control. Altogether, ATSC even envisages potential in automotive and smart homes via a network of primary and companion devices. And in the end, the TV can still get 4K broadcasts, all without paying for a subscription. The new standards suite also features tailored and location-based content and emergency alerts, the latter of which is designed to wake supported devices in “sleep” or “stand-by.” All these overlap as well, and provided that local broadcasters can afford to transition to ATSC 3.0, local emergency alerts might be supplemented with live video, localized maps, and breaking news. Under the innocuously-named "Content Recovery in Redistribution Scenarios" standard, ATSC 3.0 includes optional audio or visual watermark functionality, which broadcasters can use along with fingerprinting to identify content and then respond with a delivery of a specific payload. As ATSC states, this would then recover data not accessible via RF. ATSC does note that this would be useful when an isolated receiver/set-top box setup “is only receiving uncompressed A/V content and not the full signaling tables or alternate content choices offered by the broadcaster.” At the potential cost of audio quality, VP1 audio watermarks in an inaudible signal may trigger broadband-connected ATSC 3.0 receivers to receive a broadcaster’s payload data. Watermarking can also be used to identify number of set-top box behaviors, including rewinding, channel changing, or switching to full screen UIs. For fingerprinting, receivers extract fingerprints from audio or video frames that are then sent a remote fingerprint identification server. Upon recognition, the server returns a URL and media timing information to the receiver, which then can retrieve supplementary content. In terms of practical applications, the ATSC mentions usage measurement, interactive overlays, dialog replacements, and ad replacements. 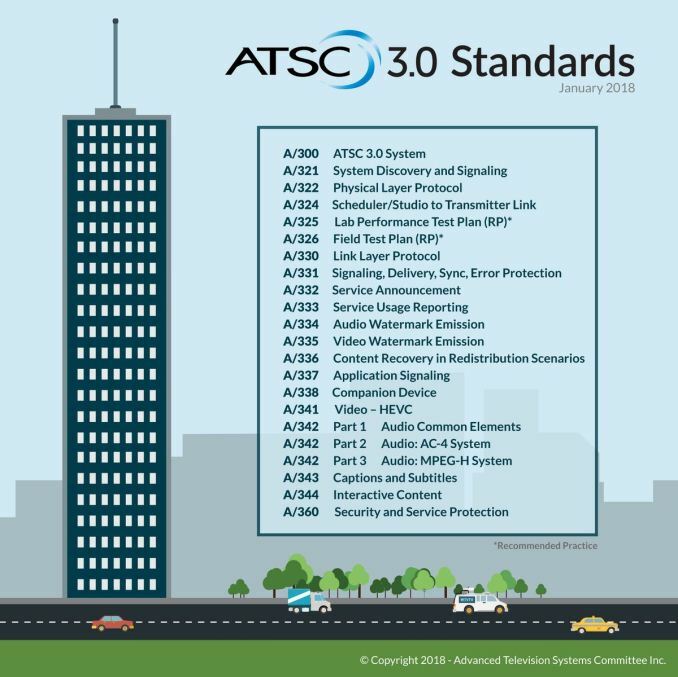 As for service usage reporting, the ATSC 3.0 has a separate standard, equally extensive. Ultimately, ATSC 3.0 is doing something very different from competing TV solutions and typical streaming services, attempting to do what streaming and TV can’t achieve their own, rather than going head-to-head. And in looking to be future-proof, a bet by ATSC for what media consumption of future might look like. For multi-device consumers who don’t concern themselves with concepts like privacy, the advertising/DRM/behavior monetization from massive and extremely specific cross-platform data could easily mitigate costs of ‘free’ over-the-air broadcasts. The result is a very different understanding of television – or even over-the-air – and one that may not be to everyone’s taste. It remains to be seen, though, the wider consequences of suddenly shifting to this paradigm from traditional over-the-air. After all, it seems that this shift wasn't decided by consumers, it was decided for them. To be clear, ATSC 3.0 is not backwards-compatible with contemporary ATSC 1.0 television sets and tuners, and with the FCC ruling this past fall, simulcasting comparable ATSC 1.0 broadcasts may be discontinued as early as 2023, with some exceptions. Given that products won't be out for a couple years, the minimum transition period from ATSC 1.0 to 3.0 could be rather short. But with all the potential upside and little downside for broadcasters and advertisers, it wouldn't be surprising if they pushed for a quick transition, and given the nature of the FCC ruling, the OTA-intent consumer market might simply be forced to accept it. 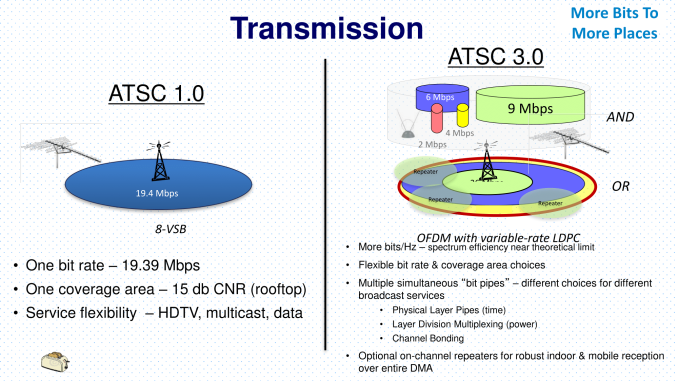 For the time being, both ATSC versions will share the spectrum. The disparate costs involving ATSC 3.0 adoption are unclear, though some estimates put it between $300,000 - $600,000 to install ATSC 3.0 capabilities in a single TV station. It should also be noted that, as readers have pointed out, the featured proprietary codecs, patents, and associated royalties in ATSC 3.0 are an additional point of contention, though these concerns were dismissed by broadcasters/advertisers and the FCC majority decision. And while companies are now stressing to the public that the push for ATSC 3.0 was not driven primarily by advertising and royalties, it was not long ago when the opposite was said, seeing ATSC 3.0 advertising and IP-based revenue as the key drivers, especially in light of stagnating growth in traditional advertising. And even in the present, outside the consumer sphere, companies are encouraging further organizational adoption with the prospect of significant growth, with total estimated yearly ATSC 3.0 revenue in excess of $20 billion, repeatedly stating targeted ads as the prime driver. In the case of intellectual property, standard-essential or otherwise core patents would be more monetizable than a larger amount of less valued peripheral patents, but licensing details are rarely disclosed. CES 2018 itself features virtually no ATSC 3.0 devices on public display. The ATSC expects that consumer products will be introduced in 2019 or 2020. More details on the ATSC 3.0 suite may be found in their system standard documentation, as well as documentation on each individual standard. microled requiring 146 inches for just 4k, it's totally out for a handful of years. Just get a nice OLED. No mention that ATSC 3.0 is a patent coated minefield complete with large royalty payments that will go on for decades? I think I'll just wait for AV1. Except a computer monitor is designed to be used at close quarters and lacks features expected of a TV today, such as a remote control. I had a 27" Samsung monitor set up with a Roku for my elderly mother briefly. It worked but it was clunky in that she had no way to adjust the volume remotely. (She rarely watches in her room but we were anticipating situations where she might be confined to bed for a prolonged period.) It stopped being a problem when we got a new, somewhat better TV for the living room and moved the existing one to her room.